Augusta Data Storage, Inc. can assist you in your records management needs through secure, off-site storage and the development of a comprehensive disaster recovery plan. Our 100,000 sq. ft. facility is designed to offer safe and secure off-site storage options for businesses, hospitals, government entities and more. We also offer climate controlled vault storage and have warehousing that is NARA certified. In addition to top-of-the line facilities, we provide barcode tracking and record retrieval services through an in-house daily courier. You will have 24/7 access to your records and can rest assured that they are safely stored and easy to access when you need them. 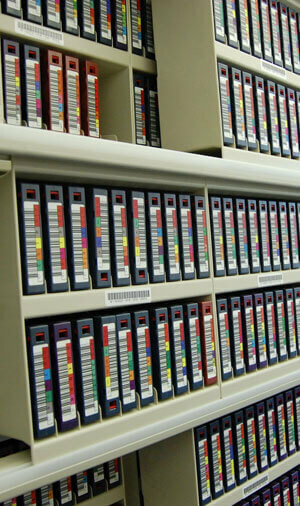 In addition to storage, we are also able to help you develop a disaster recovery plan. Why is a disaster recovery plan important for your business? Hurricanes, earthquakes and floods deal a fatal blow to thousands of businesses each year. Even more are destroyed by fire, sabotage and employee error. The downfall of these businesses is not the destruction of their facilities, but the destruction of something far more irreplaceable, their vital records. Accounts receivable, tax records, inventory data, payroll files, employee records, billing records, product development plans and customer files are all vital to the ongoing success of any organization. Records Information Management includes any and all processes associated with handling paper records related to your business. This can include employee information, patient records, client files, and other proprietary information. Developing a Records Information Management process will allow you to create a trackable paper trail for your records, helping to ensure that you are compliant with HIPAA and other laws, as well as combat potential data breach threats associated with paper records. The Records Management life cycle includes active file storage, archived files, file purging, document destruction, and the processes associated with moving your records between each of those cycles. 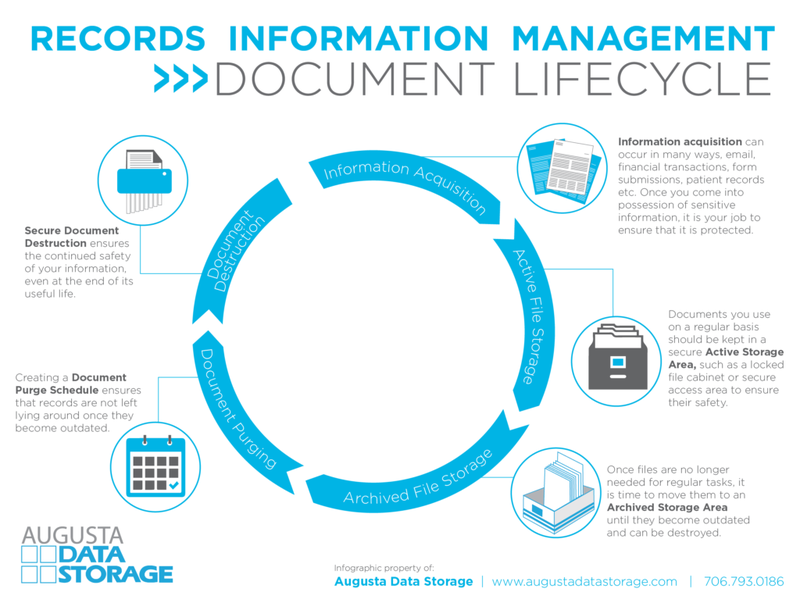 Augusta Data Storage has nearly 25 years of experience handling and managing each step of this life cycle and we can help you and your organization build a safe and secure Records Information Management cycle.